A proud dad captured the incredible moment his newborn son posed like a superhero immediately after he was born via C-section. Instead of waiting the rest of his life to achieve the renowned childhood dream of becoming a superhero, baby Harry decided to get it out of the way within the first minute of being born. Sticking his fist straight up in the air with a pure look of concentration (or maybe just a ‘what on Earth is happening? !’), Harry manages to pull off Superman’s iconic pose effortlessly. Harry, from New South Wales, Australia, was born via a planned caesarean section at 40 weeks and four days because of his large size. He weighed four kilograms at birth (8lb 13oz). His mum, Bree Jessica, described his birth as a ‘surreal experience’ and said she was lifted up so she could see Harry being pulled out. 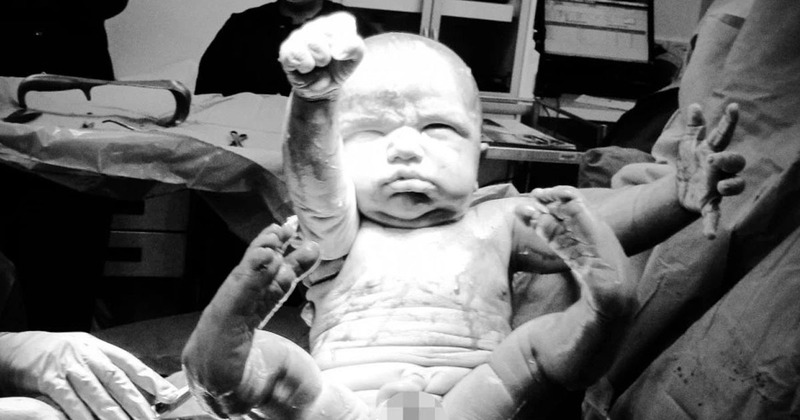 She shared the incredible picture of Harry’s birth on the Instagram account Hello World Birth to raise awareness for Cesarean Awareness Month in April. Sharing the picture, the account described the moment Harry was born as ‘a little superman entrance’ before sharing mum Bree’s story. Despite the fact Harry is now seven years old, Bree said she only thought to share the image recently to raise awareness for C-section births. Bree had C-sections with both of her sons Harry and Jack, and says she remembers the nurses asking if she was ready to meet her son before Harry’s birth. I had a planned C-section because Harry never engaged. He was sitting nine centimetres above the birth canal when he was delivered, and the C-section was actually a really calm experience. My husband was in the operating theatre with me, only leaving when they placed the epidural as he doesn’t have the best stomach for needles. Shortly after arriving in theatre (approximately 20 minutes), Bree said the doctors ‘dropped the curtain’ and she was lifted up so she could see Harry being pulled out. Bree went on to say her husband took the incredible picture of Harry, but hadn’t thought much of it until she decided to share it recently. The mum-of-two says she is keen to ’empower other women in their birth journey’ and is proud her photo could be helping other women.